Time and space are nothing else but structure repeated infinitely. A spiral inside which the chronological order and the universe, or multiverse, are just a dot in a line with infinite points. The concept of big-small, long-short, here-there, now-then looses its sense due to the lack of full perspective over reality. A sense of disorientation, physical and philosophical permeate the whole album. This record is nothing else but the perspective of single person in front of the immense; a spiritual feeling that has nothing to do with mysticism. Rhythm is used as a measurement of time. But what about rhythms that slowly become arhythmic? Or arhythmic sounds used in a steady rhythm? The effect is disorienting. But what if those sounds were not dominant, if they were in the background. Would you be aware that your perception had been altered? 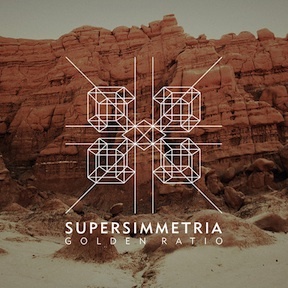 These are the questions posed by Supersimmetria on Golden Ratio. A recording where space and atmosphere are the most dominant. The varied rhythmic and arhythmic elements are never allowed to dominate the sound. All musical elements are subservient to the tranquil and spacious sound. Rhythmic elements build naturally and float through layers of the mix. Skittering beats become looped into rhythms. Fuzzed out pulses resonate and diminish. Crunchy beats that never become intrusive or loud. Vocal samples that remain ephemeral in the distance. A reocurring piano interlude that stumbles deliberately along the keys, reminiscent of Satie. All of these sounds serve and support the overall ambience of the recording. Packaged in a 6-panel digipak, limited to 300 hand-numbered copies.